Out of sight, but definitely not out of mind. While some campus construction projects are very visible to passersby, such as Scott Hall and the Cohon University Center addition, there’s a provocative project unfolding off of Forbes Avenue, nestled in between Hamburg and Smith halls, that will greatly enhance the Heinz College, improving its facilities to help meet its growing size and stature. Ranked first among graduate schools by U.S. News & World Report (2012) for its School of Information Systems and Management and ninth for its School of Public Policy and Management, the Heinz College has seen tremendous growth over the past 14 years, expanding its programs and more than doubling its number of students from 726 in 2000 to more than 1,500 today. In the past five years, 17 new faculty members and 17 new post-doctoral researchers have been hired. “The growth attests to the quality and competitiveness of the Heinz College education and to the worldwide reputation and prominence of its entrepreneurial and innovative faculty,” said Heinz College Dean Ramayya Krishnan, the William W. and Ruth F. Cooper Professor of Management Science and Information Systems. Heinz College areas also garnering top national rankings by U.S. News include public policy analysis (7), environmental policy and management (8), public finance and budgeting (13), health policy and management (16), and nonprofit management (21). “While the college’s reputation and programs have grown, its physical space has not. This investment in infrastructure is necessary for the Heinz College to stay competitive, and to attract the best and brightest students and top faculty by providing space for collaborative, project-based learning in state-of-the-art facilities. This is an urgent priority for the college,” Krishnan said. Krishnan said the new space would allow Heinz College programs to continue to hire new faculty, continue to grow its Ph.D. and master’s degree programs, and eliminate the need for space outside of Hamburg Hall. Phase 1 — completed in summer 2013 — upgraded and relocated student services offices to the ground floor and created nine interview rooms for on-campus recruiters. 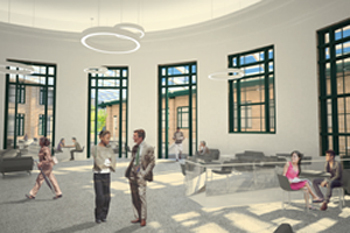 The rotunda, which currently has poor sight lines and acoustics, will be converted into a grand entrance and lobby area where students, faculty, staff and visitors can network and collaborate on projects. 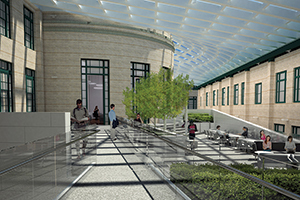 The lobby will connect to the new classroom — modeled after Rashid Auditorium in the Hillman Center — and will include a rooftop courtyard that can be enjoyed during the spring and summer months. 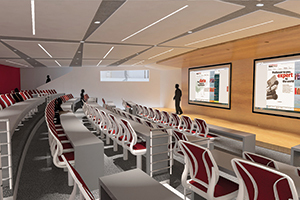 The new auditorium is expected to be operational by fall 2015. Phase 2 also will see construction of an ADA-compliant entrance to Hamburg from Forbes Avenue. In addition, existing infrastructure will be upgraded to meet current building codes. Phase 2.5 is scheduled to begin in 2016 when the Institute for Complex Engineered Systems, now located on the first and second floors of the west wing of Hamburg Hall, will move to Scott Hall. Ralph Horgan, vice provost for Campus Design and Facilities Management, said the space vacated by ICES would be made into “forward-looking classrooms that will allow faculty to experiment with new pedagogies.” The 10,000 square feet of space also will be used to create faculty and student offices. Phase 3 of the program will see construction of a glass roof above, and glass walls surrounding the rooftop courtyard of the new lecture hall. A café in the courtyard will be added once the glass-enclosed room is completed. Phase 4 will renovate third-floor faculty and Ph.D. offices, and meeting spaces. Heinz College facility enhancements will include a glass-enclosed rooftop courtyard (top photo) above a new 150-seat auditorium (middle photo) nestled between Hamburg and Smith halls. The project also will transform Hamburg Hall 1000, commonly referred to as the "rotunda," into a grand entrance and lobby area (bottom photo), where students, faculty, staff and visitors can network and collaborate on projects.